"She told deputies she is from the United Kingdom and transporting goats in this manner is acceptable there." 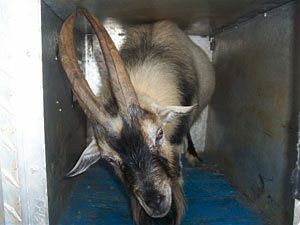 According to Ms. Enderdy--who said she had kindly obtained the animal as a pet for her four Kenyan passengers--the standards of caprine conveyance in the UK are lamentable. Please, Britishers, leave your livestock handling practices behind when you come to the USA.